No. 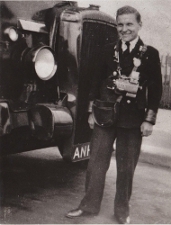 129 was new in 1945 to 'relaxed utility' standards - 'utility' standards were those set by the Ministry of War Transport and Ministry of Supply to require a minimum of materials and skilled labour, both of which were in short supply and concentrated on the war effort. Several thousand saw service in many parts of the country including Lincolnshire. As the war came towards its end, certain relaxations were made to the specifications. No. 129 did not, like many utility buses, have wooden slatted seats from new, but was originally fitted with the seats from one of Northampton's rare Grose bodied Guy FCX 3 axle buses, which was withdrawn at that time. A modified wartime livery, with grey paint (again due to wartime shortages) being carried above the lower saloon windows. 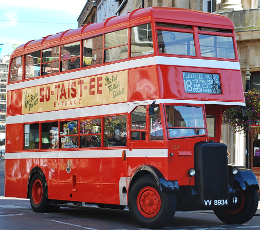 Northampton was a pre-war customer of Daimler, and (with a few exceptions) stayed loyal to the make, purchasing Britain's last Daimler half-cab buses, also Britain's last teak-framed bus bodies and last pre-selector gearbox buses, as late as 1968. 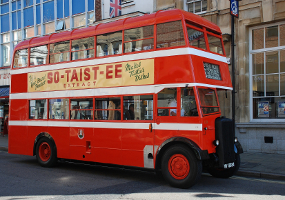 A major body rebuild took place in 1952, to bring the bus up to standards more suitable for the post-war era. This included replacement of the original seats, and the provision of more opening windows. After a further overhaul in 1955, No. 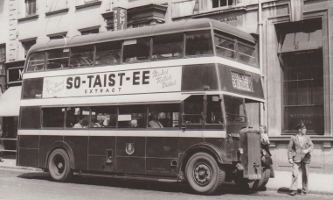 129 was withdrawn in 1959 and sold for scrap to Hunt's at Molesworth. In 1991, having managed to survive over 30 years on 'death row', No. 129 was acquired for preservation and moved to north-east England. Purchased by its current owner in 2000, an extensive restoration took place over the next ten years, and having passed its MOT in late 2010, it ran as an unscheduled 'extra' in passenger carrying service (for the first time in 51 years) at our November 2010 Open Day, the bodywork and mechanical restoration by then being complete and just the re-paint outstanding. 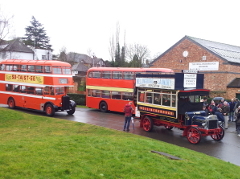 This bus joined the Museum collection in 2010, and is regarded as having significant national importance as a rare survivor of the wartime utility specification, and has become a regular performer at our 'Open Day' events and has visited a number of events elsewhere, including the 2012 Coventry transport centenary event - photo and article on 'Old Bus Photos'. 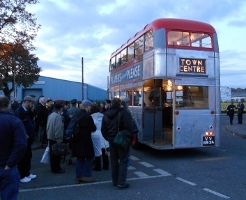 Northampton 129 'in service' at November 2010 Museum Open Day, carrying passengers for the first time in over 40 years. Very many thanks are due to a considerable number of companies, organisations and individuals in the engineering and preservation worlds for their assistance with the restoration. Northampton 129 in action on the City Centre service at our November 2010 Open Day event - video by d33206hg on Youtube. More about 129's restoration can be read here. April 2011 - This is now being painted and was ready for the Open Day at Easter. July 2011 - Now painted it awaits the vinyls to finish it off! October 2011 - All the vinyls are now on - and what an improvement these make! 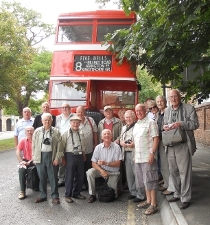 A group from the Northampton branch of the RCTS took a journey back in time on No. 129 in August 2011. 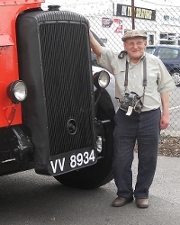 Among the party was former NCT conductor Tommy - seen (centre) in the 1950s with a post-war Daimler and (right) re-united with Northampton Daimler and TIM ticket machine. April 2013 - This bus attended the 'Wellingborough 100' event on 16 March, marking 100 years of buses in Wellingborough, Northants. January 2014 - The rear road springs are being overhauled. 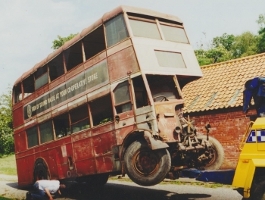 April 2014 - The two overhauled rear springs are now back on the bus, which has been MOT tested in March.